When new technology comes into my gadget lab, the cases come off and the electronic guts come out of their factory designed metal or plastic containers. Once the circuitry is modified, they typically end up in "gadget boxes" or more often hot-glued into Tupperware containers. Now there is a way to get some class with your hacks and even make them look better than what the original manufacturer had intended. Front Panel Express has a free down loadable design tool to take your dreams and turn them into engraved aluminum masterpieces, shipped right to your door. This Boss RDD-10 digital delay used to be a black and purple 1990's vintage gadget that wouldn't fit in a rack. Now you can put an etched and labeled aluminum front on that Tupperware lid. 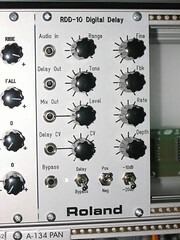 Oh, I just noticed that the module next to it is a bananalogue VCS, don't you just love that thing? I wish I had three more!